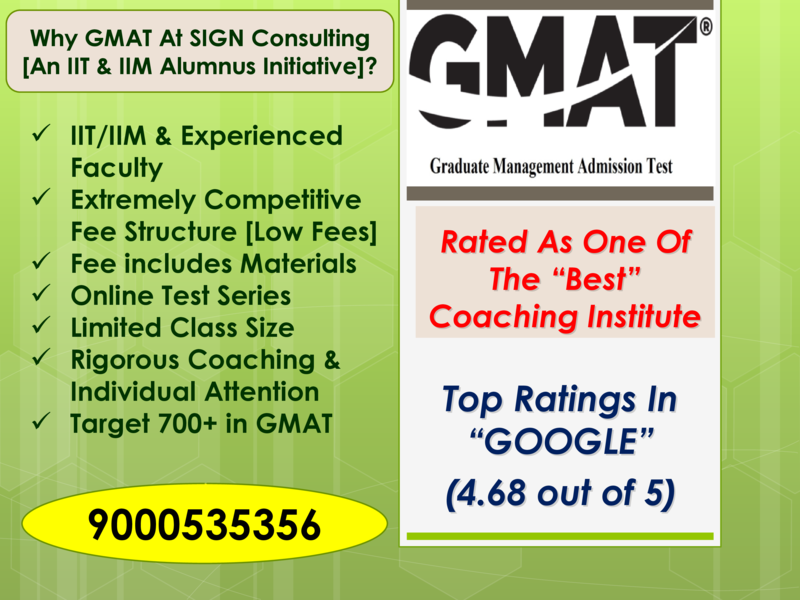 Why SIGN Consulting [An IIT & IIM Alumnus Initiative]? According to the test owning company, the Graduate Management Admission Council (GMAC), the GMAT assesses analytical writing and problem-solving abilities, while also addressing data sufficiency, logic, and critical reasoning skills that it believes to be vital to real-world business and management success. It can be taken up to five times a year. Each attempt must be at least 16 days apart. WHAT SKILLS ARE TESTED IN GMAT? WHO IS ELIGIBLE TO WRITE GMAT? According to the GMAT eligibility criteria, the official lower limit set by GMAC is 18 years. Nevertheless, aspirants between the ages of 13 and 17 are allowed to appear for the exam on producing a written consent/approval from their parent or legal guardian. WHAT ARE THE GMAT EXAM PATTERN / DURATION? The GMAT test takers will be scored on a scale of 200–800. As per the GMAT score, only Verbal and Quantitative GMAT score will impact the total score. For the Analytical writing section, candidates will be scaled on a 0–6 range as per the GMAT score 2018. Integrated reasoning will be scaled on a range of 1 to 8. According to official statistics, about two-thirds of test takers score between 400 and 600. GMAT EXAM FEES AND RETEST? The application fee for GMAT 2018 is $250, which would roughly translate to Rs.16,000 – 18,000 approximately. Also, if the applicants want to change the center or reschedule the test then they will be charged $50 extra. GMAT score is accepted by more than 2,300 institutes across 100 countries. The score is accepted in the selection procedure of more than 7000 programs around the globe. ONE CAN SUBMIT GMAT SCORES TO HOW MANY UNIVERSITIES FOR FREE ON THE DAY OF AN EXAM? One can report GMAT Scores to 5 Universities for Free on the day of an exam. For every additional university, one needs to pay $28. HOW MANY DAYS DOES IT TAKE FOR ONE TO RECEIVE GMAT OFFICIAL SCORECARD? It takes about 5-7 Calendar Days for one to receive GMAT Official Score Card. It takes a maximum of 20 days. GMAT is a Registered Trademark of Graduate Management Admission Council (GMAC).